Interzone aims to build a social networking engine based on blockchain technology. Building on Dash's groundbreaking Masternode technology, Interzone aims to add customizable attributes and expand blockchain-based distributed computing. 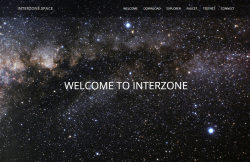 The Interzone network is completely free and open-source, decentralized, secured by CPU/GPU proof of work, and puts private transactions front and center.